Get a closer look at how the new Pagani Huayra was born, how it is built. Art and Science, two disciplines that must walk together, hand in hand. The spirit of the Italian Renaissance, applied in today's world, to create an object outside the common boundaries. The Pagani Huayra (pronounced why-rah) is an Italian mid-engine sports car produced by Pagani. Succeeding the company's previous offering, the Pagani Zonda, it will cost 849,000 Euro dollar which is around $1,100,000 US at this moment. So what kind of car can you get for more then 1 million US dollar? If you want to know keep reading please. The car itself is named after Huayra-tata, which means "God of the winds" in Quechua, the official language of the Inca Empire. The Huayra was named "The Hypercar of the Year" by Top Gear magazine and received a very positive review when tested by Richard Hammond on Top Gear. The Huayra is currently the fastest road legal and street worthy car ever tested by Top Gear. The Huayra uses a twin turbo Mercedes AMG 60° V-12 engine. The Huayra's 6.0-litre engine, the M158, produces 720 horsepower (537 kW) and 1,000 N·m (740 lb/ft) of torque. This engine is based on the old single cam three valves engine from the S65. However it is custom built for Pagani by Mercedes-Benz AMG. Its top speed is in excess of 230 mph (370 km/h) and it has a 0–60 miles per hour (0–97 km/h) time of 3.3 seconds.Using Pirelli tires, the Pagani Huayra is capable of withstanding 1.66 g of lateral acceleration at speeds of up to 230 mph (370 km/h). 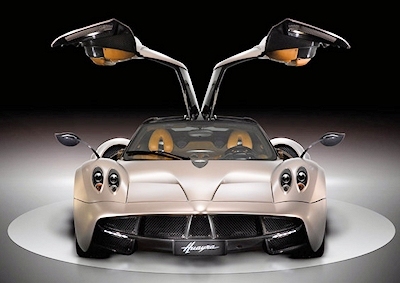 The Pagani Huayra uses a seven-speed sequential gearbox and a single disc clutch. The choice not to use a dualclutch in oil bath was made, because it would lead to an increase in weight of over 70 kg (154 lb), negating the advantage of the ability of such transmissions to change gears faster. As a result, the Pagani Huayra's entire transmission weighs only 96 kg (210 lb). The car is equipped with bespoke Brembo Brake calipers, rotors and pads. The calipers are 6-piston in front and 4-piston in the rear. The rotors are drilled carbon ceramic, 380 mm (15.0 in) in diameter and 34 mm (1.3 in) thick. There are also four independent flaps which can act as air brakes or produce down force. If you would like to know more about the Pagani Huayra Supercar visit our blog and watch an other 45 minutes long HD Pagani Huayra Supercar video. The Huayra uses a carbotanium monocoque (carbon fiber) construction. The advanced composite materials used in the Huayra were first employed in the Zonda R.
The car features gull wing doors. The fuel tank, made of ballistic components, is positioned behind the driver. All parts of all Pagani cars are made by hand, and the cars assembled by hand. 45 minutes long HD Pagani Huayra Supercar video. Do I need to say Jay Leno owns one Pagani Huayra? Check out his video when he drives his Pagani Huayra. Red Bull Formula One Racing Team's factory.